If you heard the podcast this week you will have heard me talk about the Neighbourhood Sheep Society club from Ginger Twist Studio and Clare Devine. What I forgot to mention on that show are the lovely tea hat kits that Jess stocks, which feature Clare’s designs and Jess’s hand-dyed yarn. You will have heard me talking about these hats on the podcast before – perfect for knitters of all abilities, with great interest and delightful stitch patterns to keep our interest. Such quick knits too. Today I have more ideas for your head, as well as to keep your paws cosy and we have another fantastic give-away. so read on! Earlier this year I was really taken with the Latvian Mitt Kits, which I discovered at Be Inspired Fibres on the Edinburgh Yarn Crawl. 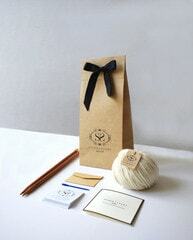 The brand is called Knit Like a Latvian and inside the beautifully presented gift box you have all the yarn and the design to create mittens from traditional colourwork patterns. The designs in these kits date to the 18th century. I think these would be an incredible gift for a knitter who enjoys colour-work or is eager to try. The Latvian Mitt Kits cost £18.99 from Be Inspired online store. If you are interested in finding more mitt kits and also sock kits from the same company you can fine them on etsy, but do remember that they are based in Riga and you may not be able to order them in time for Christmas. All the kits are made from chunky merino, which comes in a great range of colours. The yarn is imported, however the company are committed to exploring ways in which they can work with local spinners too, as they grow. I really like the style of the designs, particularly the cable coo hat, above. Hat kits start at £21 (Cable coo is £38) and garment kits cost around £60. I think these kits will appeal to more fashion-forward knitters and most of the patterns are marked as easy, so it would be a lovely gift for someone new to knitting too. If you prefer your wool reared, sheared, spun and dyed in the UK, but still want a cracking design then you are going to love Sarah Hazell’s Colour Block Cable Hat Kit. This hat is designed in aran weight BFL and masham yarn with naturally dyed Lleyn yarn from In The Woolshed and I urge you to go over to WOVEMBER to read Sarah’s piece about collaborating with In The Woolshed and their farm to yarn business. In designing the hat, Sarah said – “I wanted to design something that would be cosy in the country and chic in the city, so that everyone can experience the benefit of pure wool.” This kit would be a fantastic gift for the wool lover in your life and also for the knitter who is keen to try out breed yarns. Lleyn is a fine yet crisp wool and if you have been taking part in the swatchalong this kit would be a great way to keep on exploring single breed yarns! Sarah is also launching a KAL soon too so – f not for a loved one – bag yourself a kit and join in! The hat kit costs £15 and is available in a madder, grellow and denim colourways – all naturally dyed! Another kit for single breed wool fans is the Mitt Kit from The Little Grey Sheep. 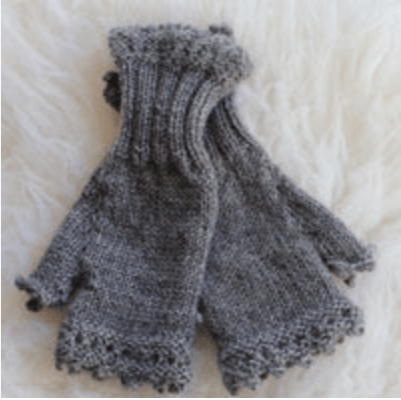 A simple, but very sweet design these mitts really let the Gotland wool do the talking – cosy, drapey with a lustrous shine! If you haven’t heard of The Little Grey Sheep this is the business at Well Manor farm in the Surrey Hampshire borders. Run by Emma and her team they keep Gotland and Shetland sheep and have the yarns spun and then hand-dyed back at the farm, by Emma. The kit is available in 5 colours of DK weight, including a natural, and contains the pattern and the yarn amount required. It costs £15 for the kit and is available from their online shop. Sarah Hazell has been incredibly generous and has sent me a Colour Block Cable Hat Kit for one lucky reader. 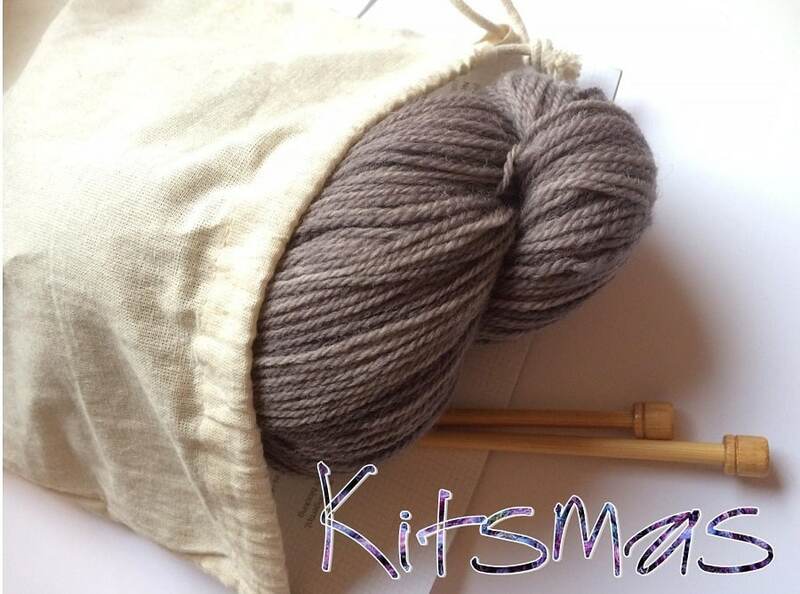 The kit – in the madder colourway, as shown above – is lovely and those lleyn natural dyed yarns are spectacular. Please leave a comment below to enter and tell me your favourite Christmas cracker joke. Getting a laugh is not a pre-requisite, but only comments with a joke get an entry. This giveaway will close at 12pm (UK time) on Tuesday 22nd December and I will choose a random drawn winner soon after. The prize will be sent out in the new year, so if you really want a kit for Christmas you better buy one today! Thanks so much to Sarah for such a lovely prize! Next week we are going to look at kits to keep our feet warm! 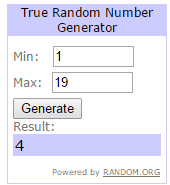 UPDATE 23/12/15: Today I used random.org to pick a winner. Well done, Snail of Happiness! I love the hat and the podcast. Keep them coming! My husband and I were blissfully happy for 20 years; then we met . How does King Wenceslas like his pizza? Deep pan, crisp, and even. Hope your Christmas knitting is finished in time. Mmm, I love madder red! Sorry, this is going to be baaaad. What did the farmer say to his noisy sheep? All lovely colours, especially the Madder. I have so enjoyed the Kitsmas postings. Why is a foot a good Christmas present? What’s a Penguin’s favourite film? What do Santa’s little helpers learn in school? I have one of the Latvian kits. Note that they have three cast on instructions and can be a touch vague, but still awesome. Lovely, lovely kits particularly those little grey mitts. I love mince pies, tho they’re another fairly uncommon thing here. Been loving reading all the other jokes….!! What do you call an underground train full of professors? I’m just catching up with your lovely posts in one afternoon, and really enjoying them. Previous Postepisode 48 Kitsmas clubs! Next Postepisode 49 spilling Edinburgh Yarn Festival beans!